The Sacher family’s famous torte influenced Viennese café culture forever, putting their brand and family name on the map. But it’s the Hotel Sacher Vienna that made them a pillar of Viennese “haute living”. This Austrian Grande Dame’s jewel-tone interiors have been the backdrop of many a ball and cultural gathering of the Austrian nobility. International political elites and artists made it their hotel of choice while in the city. Notable guests include the likes of Queen Elizabeth II and Indira Gandhi who both stayed in the hotel’s aptly named Presidential Suite where sweeping views of the city and a collection of antique furniture add to the hotel’s Old World charm. 21st century charm, on the other hand, comes courtesy of flat screen TVs and iPod docking stations. A prime location, opposite the Vienna State Opera and only minutes from the Kärntnerstrasse shopping strip, also makes it the ideal HQ from which to explore the epicenter of Viennese high culture. For that ultimate guilty pleasure, head to the tables of Café Sacher Wien where you can slice into the cake that started it all, the original Sacher Torte. Unique Location in the city center next to the Vienna State Opera. A very fine independent family hotel of the highest standards. Excellent staff. Great hotel; exceptional staff. From the minute I met with my Sacher chauffeur at the airport, I was made to feel like royalty. My ego doesn't necessarily require that much attention, but it was surprisingly pleasant nonetheless. The best hotel in Vienna. It deserves it's reputation. The Hotel Sacher is one of the most beautiful city hotels we've stayed at worldwide. The service was exceptional and the staff as pleasant and helpful as possible. Food is as delicious as we expected. A truly great hotel with lots of charm and attention to detail and a very high quality of all round service. An absolute pleasure. We enjoyed very well our stay with this classical hotel. The room was not old, efficient and very comfortable. Rest of the hotel was old but very good condition so we could easily feel the luxury of old times of Austria. Hotel Sacher is a perfect classical five star hotel. Old fashioned courteous service with charm and warmth. The whole hotel has been refurbished since we visited during the 1970s. The style of decoration remains in keeping with the importance of the hotel's historical past. Quite grand and lovely but still very relaxed and comfortable. It's a fantastic experience: very personalized and completely different from what you will get at a hotel chain. Excellent hotel with friendly and professional staff. It’s atmosphere of intimacy and serenity make it a great experience. The hotel we were hoping for on our trip to Vienna. It is historical, the decoration is refined and the atmosphere intimate. The room is painted in a calming blue hue, the furniture is beautiful and the bathroom is pleasant. We particularly appreciated all the little details in our room: the Sacher Torte upon arrival, the fruit basket and chocolates every day and the white rose in our bathroom in the morning. The breakfast, just like the hotel, is near perfect, thanks to the setting, the variety of products or the efficient and all-smiles service. The same comments apply to “Le Rote” restaurant. To conclude our journey at the Sacher was crucial for our Viennese escapade to be a success and that’s exactly what it was. 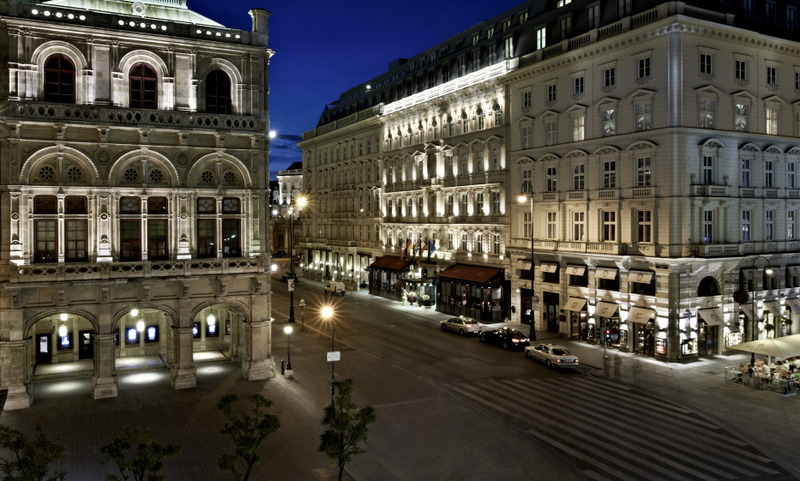 We don’t see ourselves visiting this city without staying at the Hôtel Sacher Vienna. We would stay there again, but would want a bigger room. More than faithful to its excellent reputation. Very pleasant attempt to speak French from the waiters and sommeliers in both restaurants. We were lucky enough to get upgraded to a suite. The whole thing, from checking in, to the room , breakfast, staff, checking out cannot be faulted. A perfect experience. The staff is courteous and friendly. Very nice small hotel. The spa is small but upscale.